SANEK Neck Strips are a must-have for any salon! Most states require there to be a buffer between the client's neck and the styling cape. Why use rough towels that collect hair as this buffer? 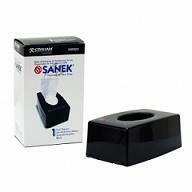 SANEK Neck Strips are a sanitary and cost-effective solution to this dilema. You will save money every time you reach for a neck strip instead of a towel that you will have to spend time and money to wash after each use. These strips are made of soft and highly absorbent tissue that streches to fit any and all sizes of clients. They absorb any perspiration or any drips from chemicals that may have seeped through, if the strip was not in place, and damage a client's clothing. Your salon needs SANEK Neck Strips. Features: Great alternative to towels. Cost-effective. Sanitary, disposable buffer between client and cape. Soft and highly absorbent. Stretches for one size fits all. Catches any chemical drips. Dimensions: Length: 17.5" Width: 2.5" 12 boxes 12 packs of 60 strips (720 per box; 8,640 total). 2.5″ x 17″ (6.35cm x 43.18cm) (40 Strips/Pkg )Packing: 9 Pkgs/Carton.